Anxiety is a natural experience for most of us. It makes us feel uneasy, stressed and agitated. When anxiety disables someone from carrying on a normal life, it becomes a disorder. 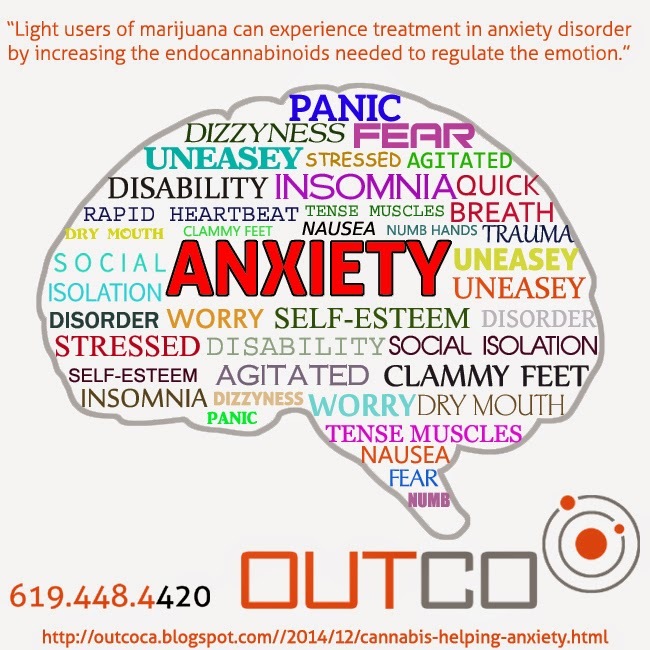 Cannabis is a safe and natural way to cope with the symptoms of Anxiety Disorder. OUTCOin San Diego is a legally licensed dispensary which provides cannabis for a variety of medical issues, including Anxiety Disorder. Anxiety disorder can occur as a panic, social, phobia or a generalized worry that won't go away. Symptoms include fear, panic, insomnia, quick breath, racing heart, inability to self-sooth, dry mouth, nausea, tense muscles, dizziness, and clammy or numb hands and feet. Environmental stress, heredity, and trauma are factors that contribute to this disorder. Sachin Patel, M.D., Ph.D., professor of Psychiatry and Molecular Physiology and Biophysics in Vanderbilt, has been at the forefront of research for the benefits of cannabis relating to brain function. Published in the March 2014 issue of Neuron he writes about endocannabinoids in the amygdala. The amygdala regulates memory, anxiety and the "fight or flight" response in the brain. Cannabis regulates the brain function to aid in the treatment of anxiety disorder. OUTCO dispensary in San Diego has knowledgeable staff that can discuss which options are right for each patient.